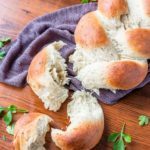 This 60-minute homemade herb bread is not only a showstopper, it's delicious and one of the easiest yeast breads you'll make! Perfect for any skill level! In a large bowl or the bowl for a standing mixer, whisk 4 cups of flour and the rest of the dry ingredients together. Whisk milk, olive oil, and egg together. Pour into dry mix and start to combine. While the dry ingredients and milk mixture combine, slowly pour in the water. The dough should be slightly tacky. It will clean the sides of the bowl but stick to the bottom of the bowl. Add more flour, if needed. Once dough is the correct consistency, knead for about 5 minutes until the texture is smooth and elastic. You should be able to stretch the dough a bit without it breaking. Cover the dough and let rest in the mixing bowl or on the counter for 15 minutes. After the dough has rested, form it however you'd like. To make a braid, separate it into 3 pieces and lay them flat on a lined or greased cookie sheet. Starting at the top, bring the outside strand over the middle strand, so it becomes the new middle strand. Repeat with the opposite side. Repeat this pattern until the whole loaf is braided. Pinch and tuck under both of the ends. Cover and let rest 15 more minutes. Bake on a lined or greased cookie sheet for 20-25 minutes, until the top is golden brown. The internal temperature should register between 205-210 degrees F if you prefer to use a thermometer. Brush top of baked bread with melted butter and let cool. The exact amount of flour you will need for this recipe (or any baking recipe) can vary by as much as a cup. This is due to altitude, humidity, and weather. I live in an arid high-desert mountain climate, so often my readers need to add additional flour if they live at a lower elevation with more humidity. Reference the video for how sticky the dough should be. If you'd like to make rolls, divide the dough into 12-16 pieces. Push up and stretch the dough down over your thumb and then pinch the bottom together to create tight rolls that will rise well. Check these after 15 minutes, they will bake more quickly. This dough freezes very well. I often divide a batch or two up into rolls, skipping the last rest step, and place them in greased disposable pie or cake plates. I put the whole plate in a zip-top bag and freeze flat for about 30 minutes until the dough is firm, then you can stack them in your freezer to conserve space. To bake the dough, I get it out about 45 minutes before I'd like to bake it. Bake at the same temperature and time as listed above. If you want to bake the frozen dough, place it in a cold oven and preheat to 350 degrees F and extend the baking time about 5-7 minutes.